I had planned from the beginning that this sink would be a slotted fin version, but I decided to assemble it before I cut the slots in the fins for some tests. The testing was started with a 30mm TEC installed. While this sink is larger than most of the current crop of commercially available dual-fan sinks on the market, I was unsure how it would handle the heat from the 40mm TEC. 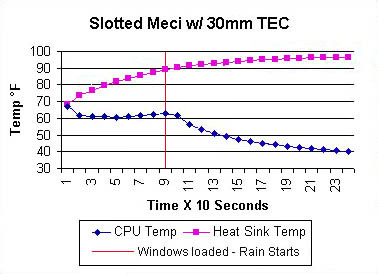 The 40mm TEC that comes with the Meci unit is rated at 6 amps, while the 30mm unit is only rated at 3. I measured the temperature of the processor and heat sink through the boot up and into Win95. This first few minutes of operation seems to be the most important for letting me know how stable the system will be. 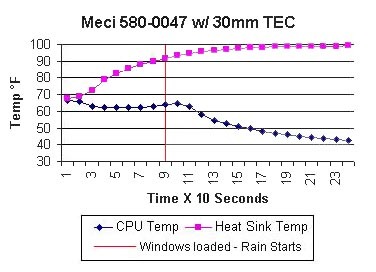 Once Rain kicks in, the processor cools back down quickly. Even using the 30mm TEC instead of the 40, this sink is clearly having trouble dealing with the heat. With a room temperature of about 68°F, the performance is barely acceptable. 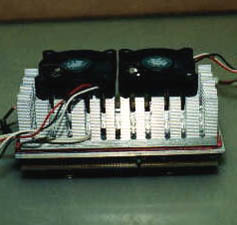 A quick Quake2 game produced heat sink temperatures around 107°F and processor temps in the low 70's. While I had no lock-ups, the chances that I would have problems with heat once the room temperature got into the mid-seventies was pretty evident. With my new circular saw blade, cutting the slots was a piece of cake. 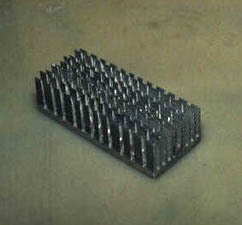 Just do some measuring and lay out the cuts so the screws that secure the fans will have metal to bite into and make some passes through the table saw. It couldn't be much easier. Even with the fact that the center insert had to be removed and cut separately and that the blade leaves a little flashing on the edge of each cut fin which must be cleaned up with a file, the whole process took only a couple hours. Ok, so it came out looking pretty good. How much more heat did cutting the slots get rid of? The answer is not a tremendous amount. The boot-up process came down a couple of degrees and the temperatures in a game or 2 of Quake2 came down to a more reasonable level, but this sink still needs more work. 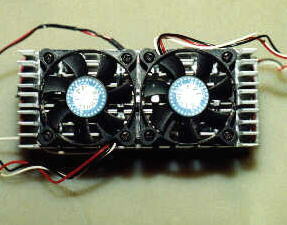 I have some 60mm X 25mm - 25 CFM fans coming to replace the 50 X 10 - 8 CFM units that I'm now running. I'm hoping that the added airflow will bring the temps down far enough to try the 40mm TEC. My guess is that this will work. I will try the 40mm TEC at 5 volts and if I'm successful, I'll push it up to 7, and then 12.